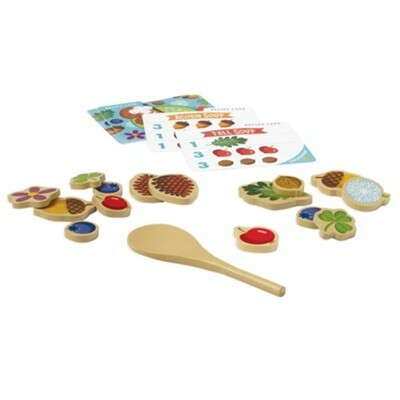 Encourage early learning skills with the Acorn Soup Game from Peaceable Kingdom. Designed for ages 2 years and older, making Acorn Soup is easy as 1-2-3! The round box bottom doubles as a bowl, which contains wooden ingredients and a sturdy wooden spoon for mixing and stirring. Simple recipe cards teach toddlers to identify the ingredients and count as they cook. Mix, stir, eat and play together! Counting, pretend play, sorting, fine-motor skills are benefits of this fun, interactive game! Includes: 8 recipe cards, 24 ingredient tiles, 1 wooden spoon, parent guide and instructions. I'm the author/artist and I want to review Acorn Soup Game.